Self-Settling guide for a baby who is not yet standing. At the recommended sleep time, swaddle your baby (if your baby is still at the swaddling stage) and put her in bed on her back without a dummy. Walk out of the room leaving the door halfway open so your baby can hear you. Allow her to protest (cry) for the amount of time you feel strong enough to leave her for – you need to stay out for the recommended minimum times as in the table if you are going to successfully teach your baby to self-settle. When timing the recommended minimum time, only count continuous protesting: if there is a gap of five seconds or more you need to start timing again. The longer you are able to resist going in and helping your baby settle, the faster your baby will be able to learn the important skill of self-settling. Always time the time with a watch or timer as 1 minute may seem like an eternity when you are listening. It is important to remember that a protesting cry is normal and doesn’t necessarily mean that something is seriously wrong. In teaching a baby to settle herself, inevitably there will be some protest cries. 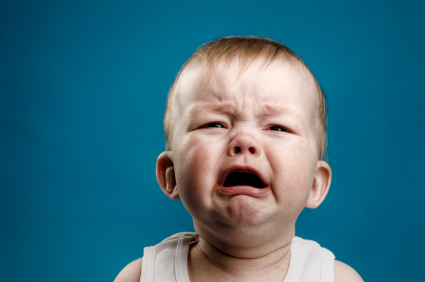 If you listen to your baby’s cries, you will notice they become very high-pitched after a while. Most parents have never heard this pitch of crying before and they therefore give up, thinking there is a problem. However, when I am working with parents and their babies I note this as a turning point: your baby will soon be asleep. This high-pitched crying is often described as ‘peaking’. If you do not respond to these high-pitched yells, your baby will start to fall asleep. Also during this stage, there will be breaks in the baby’s protests – these gaps will start to get longer and the shouting shorter until finally your baby is sound asleep. When you are sure your baby is asleep, wait a few minutes before going in to reposition or cover up. Try not to reposition her too much as you may accidently move her away from something she was comforting herself with before falling asleep. As a parent remember that the crying will be less frequent and shorter in duration as your baby develops the skills to settle herself. move your baby onto her side. Try to avoid eye contact while moving and settling your baby. Place one hand on her shoulder and gently rub or pat the baby’s back with the other hand. You will try to settle her for 22 minutes. If after 22 minutes your baby has not settled, you could get your baby up for a ten-minute break, but if you are still feeling strong and confident and patient, keep up the settling techniques (rubbing / patting) as the break is for your benefit not your baby’s. If you choose to take a break, begin the whole process again afterwards, starting with staying out for at least the minimum time. 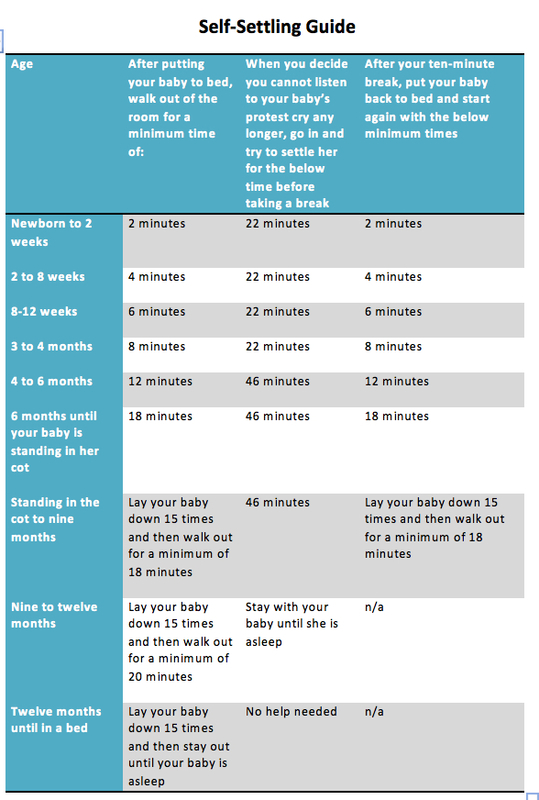 If your baby is over sixteen weeks but not yet standing, follow the above guidelines but try to settle your baby for at least 46 minutes. If after 46 minutes you need a break, then get your baby up and take one. But again, this break is for your benefit, not your baby’s, so if you feel up to it try to settle your baby for longer. Don’t give up. This will work and your baby will learn to self settle! Once your baby is asleep, carefully put her back onto her back. If you find it easier you could settle by rubbing your baby’s tummy or forehead so you don’t have to change her position once asleep. It is normal that when your baby has settled to sleep she will wake again after just one sleep cycle. As frustrating as this may seem, during the day you need to get her up and praise her for going to sleep in the first place. Your baby will soon start to resettle and sleep longer but only after she has learnt the skill of self-settling. If you know your baby needs more sleep, go for a walk or a drive so she can perhaps have a nap before her next milk feed. If your baby wakes during the night, feed your baby if she is still having night feeds and then settle her with the appropriate settling techniques for her age. If your baby is no longer having night feeds, do not go in to settle her until the minimum protest time has passed. But remember that your baby is more likely to get back to sleep if you stay out of her room – going in may wake her up further.